If you are a foodie that like Chinese food you would enjoy the endless variety of casual entrées called 少菜.They are affordable and represents some of the best of Chinese cooking. This dish is very simple. It is made with grouper and celery. Like most casual entrées 少菜 it is intended to be eaten with a bowl of white rice. Rice and wheat both are the most important staples of Chinese (as well as many Asian cultures) diet. Rice consumption is higher in the south while wheat are consumed more in the north. China has countless variety of noodles made of different grains including wheat, rice, and even beans. In this post I made dishes with a fluffy wheat noodle. In Chinese it is called 伊麵 (pronounced as yie mein). This noodle is made with wheat flour and baking powder and then deep fried to give it a very airy texture. Because of the additional steps by weight it is more expensive than other noodles. Ever since I bought Brunnhilde there is this mystery bracket on the base of the driver seat by the door. I was quite sure it is for mounting a fire extinguisher. I have been wanting to find a good size fire extinguisher with a compatible bracket awhile. Recently shopping at Costco I found this 5lb ABC extinguisher on sale. I have considered buying it in the past and the discount just push me to make the purchase decision. Shark fin has been used as ingredient in luxury dishes in Chinese haute cuisine. It was served in the most special occasions such as wedding banquets and meals in the imperial palaces. During my youth growing up in Hong Kong my parents would bring us to wedding banquets of our friends and relatives. It was only in these special occasions where dishes with shark fins were served. 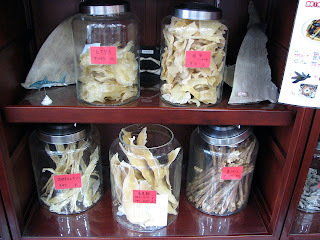 Typically the shark fins are prepared as a viscous and tasty soup. This soup is most often served among the 10 or so entrees during a banquet.